Our MTP / MPO Selection includes Premium MTP Cassettes, MTP Cables, MTP Trunk Cables, and MTP Fanout Cables. All of our Signature Custom QuickTrX MTP Fiber Cables are manufactured in the USA with premium optical fiber. Our strict quality control assures that the product you receive has been rigorously tested and made to the highest standards. Optical fiber networks require two fibers to make a complete circuit. The matching of the transmit Tx signal to the receive Rx equipment is referred to as polarity, and a transmit and receive side on optical transceivers usually use a duplex fiber connector to maintain the polarity. On most cabling systems, maintaining polarity just requires that the A side of one connector pair matches the B side of the other connector pair, with fiber connectors such as ST, LC, SC, and MTRJ. MTP/MPO high density network design requires its own set of rules regarding maintaining polarity throughout the link. These three polarity methods are commonly referred to as Method A, Method B, and Method C, and we will discuss the difference further here. This type of MTP cable has a key up key down position, and the fiber remains the same straight through the cable. Therefore each fiber is in the same position on each end of the cable. Fiber 1 in the cassette mates to Fiber 1 in the cable assembly, which mates to Fiber 1 in the end cassette. The transmit/receive flip must happen with the patch cords either at the beginning or end of the link to ensure proper transceiver polarity. This method utilizes a key up to key up position and this fiber cable is fully flipped on either end. This type of mating creates an inversion, where Fiber 1 is mated with Fiber 12, and Fiber 2 is mated with Fiber 11, etc. For these cables to preform properly, one of the cassettes would need to be inverted internally for Fiber 12 is mated with Fiber 1 at the end of the link. This method requires two different cassettes with special labeling to identify which one is flipped. This circuit is completed with using straight patch cords at the beginning and end of the link. *Note- method B is not compatible with our standard QuickTrex cassettes. 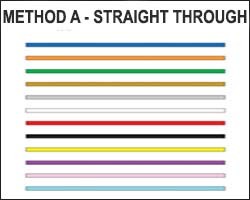 Method C and Method A are very similar, with the main difference being the flipping of the patch cords in the link. 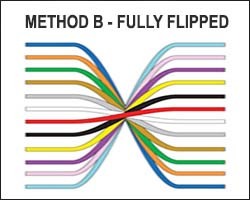 This method uses key up key down, and the polarity flip takes place within the cable itself. 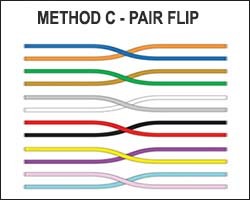 Each adjacent pairs of fiber at one end are flipped at the other end. So Fiber 1 and Fiber 2 becomes Fiber 2 and Fiber 1 at the other end, and so on. This circuit is completed by using straight patch cords at the beginning and end of the link. Most people in the industry refer to it as MTP it is actually correct to call it MPO. The term MTP is a registered trademark of US Connec and identifies their specific brand of the MPO-style connector. The name MPO stands for Multifiber Push On and typically consists of a 12 strand Ribbon Fiber that is terminated to a single compact push on connector. As I shine a light on one side with the light in motion, you will notice the light emitting from the opposite connector in a duplicate motion. That is because the 12 strands of fiber are terminated side by side horizontally across the tip of the connector. Another component of the MPO System is the cassette. The MPO cassette enables you to easily transition from the MPO to any other connector type. All 12 strands are instantly connected with one push of the MPO connector to the back side of the cassette. The cassette is internally connected to transition to the 12 connectors on the front of the cassette. In this case we are showing a cassette with ST connectors. To demonstrate I will shine a light into one cassette and you will see the light in the same pattern on the opposite cassette. The cassettes are made to snap into a Fiber Termination box. The QuickTreX cassettes we offer are made to fit into Multilink brand boxes. The MPO system is very well suited for use in data centers where high density and convenience are important. Our QuickTreX Brand MPO cables and cassettes are custom made and are of the highest precision and quality.